weekend | What's Peeps Thinking About Now? It's Probably Random! UPDATES POST: Thursday, November 19, 2015, 4:35 a.m.
More data is in and it’s looking very wintry Friday night and early Saturday and this will likely turn into a moderate snow event (a heavy snow event to the north of the Quad Cities). Remember that the first flakes will not arrive until Friday afternoon or evening, so this forecast could change many times before then with the snow forecast totals shifting north or south and the numbers could go up or down. Keep up on the latest forecast. That’s why you have me! ORIGINAL POST: Wednesday, November 18, 2015, 4:40 p.m. The first half of this week featured temperatures in the 60s and over two inches of rain. After a sunny day Thursday and for part of Friday, our first measurable snow of the new winter season arrives Friday evening and Friday night. The quick-moving snow maker will not only whiten the ground with possibly several inches of snow, but it’ll bring in the coldest air of the season. By Sunday morning, low temperatures will be dropping into the lower-teens with a few single digits possible. A rain/snow mix will develop Friday afternoon across eastern Iowa and northwestern Illinois. Temperatures will be around 40°-45°. By evening, as the air cools into the 30s, the wintry mix will change over to all snow and continue into the early part of Saturday. If you’ve been following my forecast and analysis of this system, I said the snow will have to come down hard enough Friday night to overcome the warm and wet ground. I’m thinking that will happen and we could see the snow fall at a nice pace for about six to nine hours Friday night. Lows in the 20s will help the snow to accumulate. This map shows that the highest chances of seeing snow accumulations of two inches Friday night into Saturday morning will be north of Interstate 80. Where you see light blue and peach, chances are 70-90%. In the Quad Cities, those chances are at 30-60%. At this point in the game, remember that the storm that will race across the Rockies and Plains Friday and into Iowa and Illinois Friday night and early Saturday is still out in the Pacific Ocean near Alaska. Once it comes ashore, we’ll have a very good data to help forecast this snow event. The bottom line is that (1) we’ll pretty much see our first snow of the 2014-2015 winter season, (2) accumulations are likely in our area and heavy snow will likely fall in parts of Minnesota and Wisconsin, (3) the coldest air of the season arrives this weekend in the wake of the snow, and, most importantly, (4) the forecast will change some Thursday as sampled data from the storm comes in and we’ll have a solid forecast for snow amounts. Have those shovels ready in case you need them. 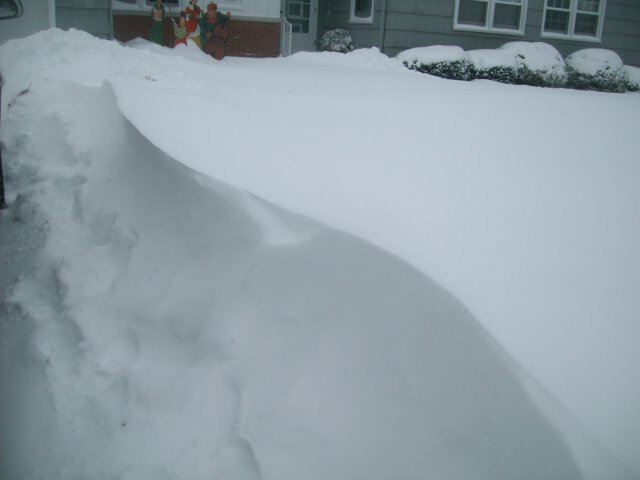 At the very least, be ready to sweep off your steps, sidewalks, and driveways with a broom. I hope you’re stocked up on whatever you might need to wait out this weekend’s snowstorm. If not, you still have until early Saturday afternoon. This is going to short and sweet if you like snow. Heavy snow is on the way Saturday evening through Sunday evening and some hometowns may have a foot of new snow on the ground by the time it ends late Sunday night or early Monday morning. A “Winter Storm Warning” has been issued for all of eastern Iowa and northern Illinois from Saturday evening through early Sunday night for heavy snow this weekend and gusty winds, considerable blowing and drifting snow, and falling temperatures Sunday. A rain and snow mix will begin early Saturday afternoon across our southern hometowns and it will move northward and quickly change over to snow. Moderate to heavy snow is likely for about a 12-hour period Saturday night into early Sunday. This is the where the GFS has the storm system at 6 a.m. Sunday. The darker shades of green show where the moderate to heavy snow will be falling. Now, let’s talk snow amounts. The storm has made another shift to the north in the overnight hours, so that means that the heaviest snow will also shift northward out of central Illinois, which was the thinking Friday night. For simplicity’s sake, 6-12″ of snow are possible with this storm from Saturday evening through late Sunday night or early Monday morning! In the Quad Cities, I’m expecting around 10″ of snow. Right along Interstate 80 and to the north, that’s where the heaviest snow will fall. Amounts of 8-12″ are likely. If you live south of I-80, you’re still going to be heavy snow. Amounts of 6-10″ will fall there. Remember that with any snow event, there could be isolated higher totals in any of these ranges. If we pick up more than 8.3″ of snow in the Quad Cities from this storm, it’ll be the biggest storm since that much fell back on February 26 and 27, 2013. And, it was four years ago today (on the calendar) that a three-day snowstorm started in the Quad Cities that would bring 18.4″ of snow to the area, tying a 1979 snowstorm for the biggest snow event in Quad Cities history. In that 2011 storm, 14.8″ of that 18.4″ total fell on February 1st alone. This is a dangerous situation unfolding with heavy snow, strong winds Sunday approaching 40 miles-per-hour, and considerable blowing and drifting snow. Additionally, by Monday morning, temperatures will be near zero and wind chills will be much colder. Monday’s highs will only be in the teens. Since all of the pieces of the puzzle are in place, this is my only post today — unless something drastic and unforeseen happens.